I read today that Windows Update would not work with the beta version of Internet Explorer 8. I did want to check it out for myself before writing about it and went to the Windows Update website which greeted me with the error message "The site cannot continue because one or more of these Windows services is not running", Error number: 0x8DDD0018. The services mentioned were Automatic Updates, Event Log and Background Intelligent Transfer Service (BITS). I started services.msc and set all three services to manual that I could start them afterwards. I refreshed the Windows Update website but received the same error message that one or more of the services were not running. I double checked and all three were running. After reading the error description more carefully I discovered that it was not sufficient to just have the service running. No, it was necessary that two of the services, Automatic Updates and Background Intelligent Transfer Service, had to be set to automatic. Once I did that the error message went away and I was able to update Windows XP using Internet Explorer 8 Beta 1. Yes, that did work which is why I'm writing this article instead. 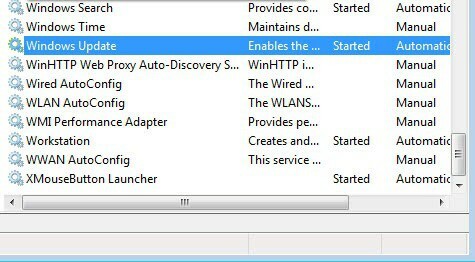 If you run into troubles with services and Windows Updates make sure the two services I mentioned are set to Automatic. Update: Windows Update can't be accessed via the web browser anymore in newer versions of the operating system. You can either load it directly from the operating system to open it up as a control panel applet, or download patches manually from Microsoft's download center. If you have configured automatic updates it is important that the Background Intelligent Transfer service and the Windows Update service are set to automatic for the updating to work automatically. I have been trying to solve the same problem these last few day and none of the solutions I have found worked. My problem is, it says automatic updates are not enabled, but when I go check in the control panel, it says it is on. And all the other things it says to run automatic are on! Margie, change the Automatic Updates and the Background Intelligent Transfer Service startup type to automatic (as per Martin.s original post). Mine where running but configured to manual. I had the same problem on a Windows 2003 Server and it solved it. you just solve my big problem it took me 2 days until i fund you solution. Well what do you know, it worked like a charm! Thanks dude! Please help me. ive done everything from what martin.s posted. when i set the start up type to automatic and then start the service status, this error message pop up — Could not start the Automatic Updates service on Local Computer. Error 1058: The service cannot be started, either because its disabled or because it has no enabled devices associated with it. — and ive already set the automatic update to automatic at the control panel. and also this message appears when i press start service. Thanks. Why they need to be set to automatic is beyond me, but after trying numerous lengthy fixes, this worked. Whole lot of wasted effort with such an easy solution to shifty coding. I did the servies.ms but when i went to AUTOMATIC UPDATES and changed it AUTOMATIC, it keeps changing itself back to DISABLED!!! This is very frustating cuz i can’t get any updates!! If anody can help, please do!! Donavan says: I did the servies.ms but when i went to AUTOMATIC UPDATES and changed it AUTOMATIC, it keeps changing itself back to DISABLED!!! Thanks. Worked like a charm and saved me with wasting my time with support. btw microsoft support is free for update related issues. Yeah you is right bro it detects if all 3 services are set to auto.Not just started.But the funny part is BITS doesn’t even come default auto with XPPRO SP2.Its set to manual.Therefore MS Update wont work with default Pro SP2 settings. Thanks!! This has been driving me crazy for a while but your solution worked! Switching ‘Automatic Updates’ from Manual to Automatic fixed the problem for me (on Windows Server 2003), but I didn’t need to change BITS from manual to auto. Can anyone advise how I can restore back my administrative tools? Works great! Respect to the author disclosing it and saving me from wasting time of fighting with that stupid IE! Microsoft, trush IE and save the planet! You solved the problem for me. Thanks! W00t! Good solution. Deservedly appears first in the Google search for the error. that stupid error drove me crazy….. Looked all over for this fix -had me stumped for days. Hey ….I am facing a Problem in Windows service….My Windows service runs only Once when just started.And time interval is not working over there.Pls Reply its Urgent. It worked!! Now if I can stop beating my head against the wall after finding how simple it was. Reading is fundamental. After spending 2 hrs. online with a support person, who was actually quite good, I found this article. The problem was resolved just as the article said. Thank you so much. Windows UPdate is also set to Automatic and is RUnning. Still I get the message WIndows Update service is not running. I am bugged with this problem. Any other tips to come out of it pls……….